FirstMetroSec PRO is by far the most advanced online stock trading platform available for the Philippine Stock Market. The new Internet-based system is designed for active traders who need fast access to the most relevant trading information. 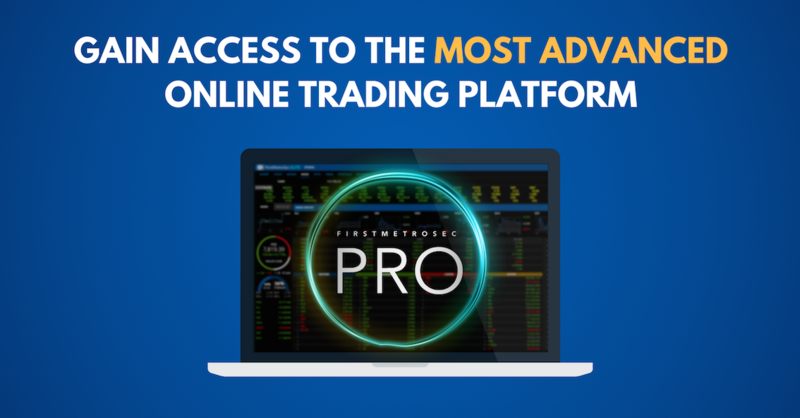 PRO introduces features that were previously only available to industry professionals, that enable closer market monitoring, faster trading, and better portfolio management. Is PRO available to all FirstMetroSec clients? Access to PRO is exclusive to clients who meet minimum requirements. What requirements are needed to gain access to PRO? PRO is available to clients who trade at least P100k in accumulated value per month, or maintain a mutual fund/stock portfolio of at least P200k. Once qualified, how long will it take to activate my PRO access? Please note that batch activation of PRO accounts is done every Wednesday. You will be notified via email on your registered e-mail address. Is there a way to check if I am eligible for PRO? Please send us an e-mail and include your online trading account code (OTA code) and Account Name at customerservice@firstmetrosec.com.ph. Do I need a FirstMetroSec Account to gain access to PRO? Yes, to be eligible for PRO, you should be an existing client of FirstMetroSec. Is there an expiration date on my PRO access? PRO access is valid for one (1) month unless stated otherwise. What are some of the new benefits/features of FirstMetroSec PRO? Can I withdraw my funds through PRO? You can withdraw your funds only through the classic site. Can I log in to the classic site and PRO at the same time? You can only log in and use either of one of the two trading platforms at a time. Are there fees for using the PRO platform? PRO access is free of any fees for eligible clients. I currently cannot meet your existing criteria, is there a subscription plan for PRO? We are currently working on PRO’s pricing model. Please stay tuned for announcements. Is there a mobile app for PRO? We are currently developing a new app for PRO. Please stay tuned for announcements. Are there only hours to access PRO? Access to PRO is available 24/7, anytime, anywhere. Where can I see tutorial videos for PRO? Tutorial videos for PRO are posted on our Facebook Page and YouTube Channel. Please follow our other social media platforms to receive announcements and updates. Do you have Webinars or Seminars on PRO tutorial?